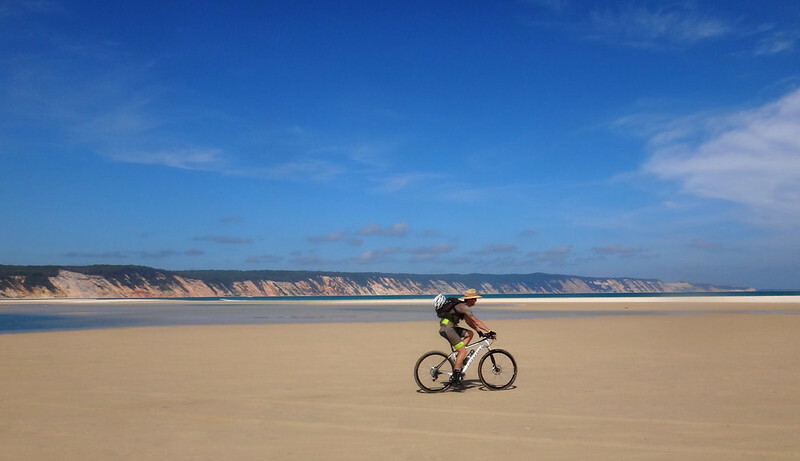 During a family holiday at Rainbow Beach, I decided to enlist the help of a couple of riding buddies to see if we could complete a huge 100km ride along the beach before the tide washed us away. 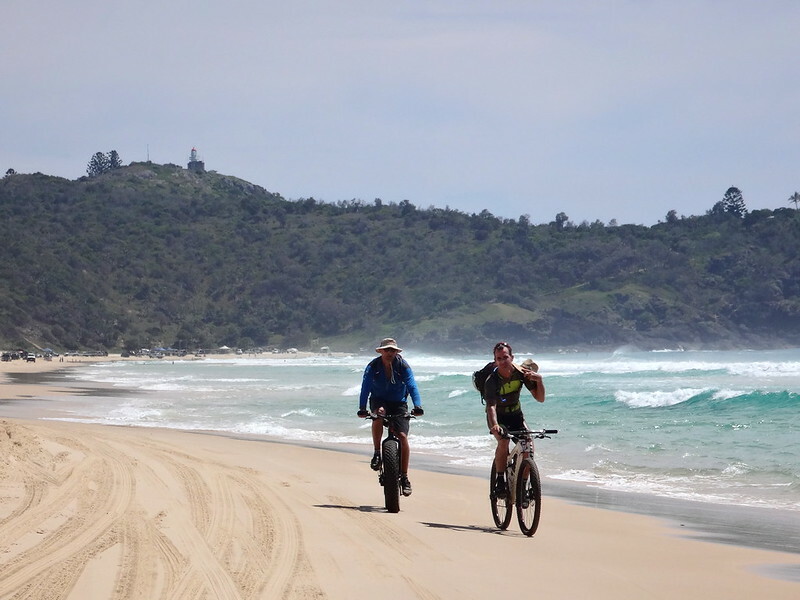 In a single day Paul, Jason and I planned to ride out to Double Island Point, down the coast as far as Teewah, then back to Rainbow Beach. The low tide was at noon so we started on a falling tide. 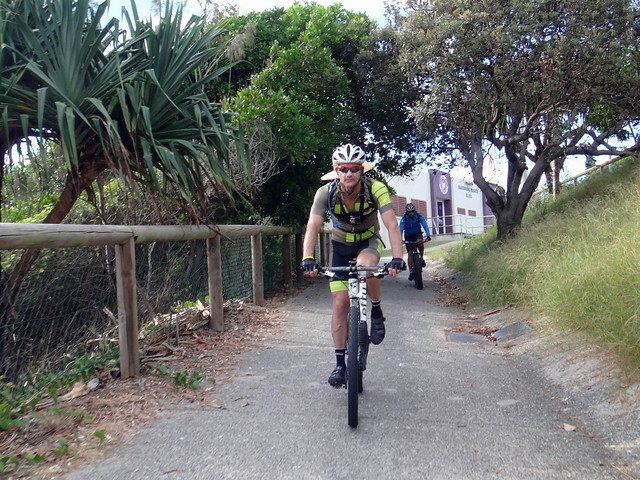 This was an ambitious plan, but we agreed that the main priority was to enjoy the ride – rather than turn the day into an ordeal by pushing too hard. We thought we might be able to use water from creeks like this if we ran low on water during the day. 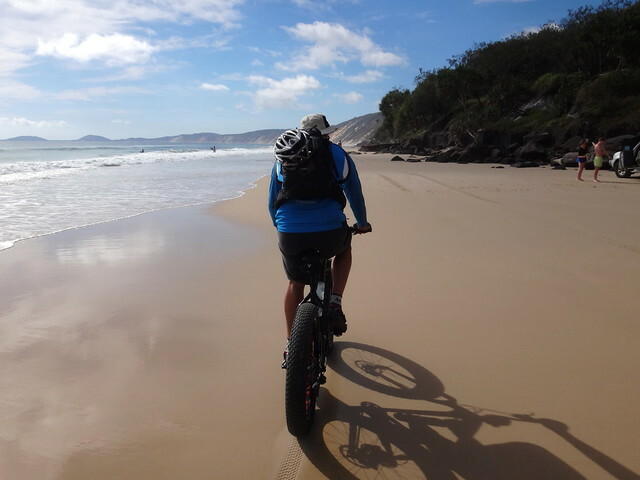 After about an hour we reached “Honeymoon Bay” – the end of the first section of beach on the northern shore of Double Island Point. Vast tracts of sand were left as the tide continued to recede. This is a great place to ride on a falling tide, but I imagine the wide flat sand bars could prove treacherous when the tide was riding. It’s definitely not the place you’d want to leave a 4WD parked for too long. 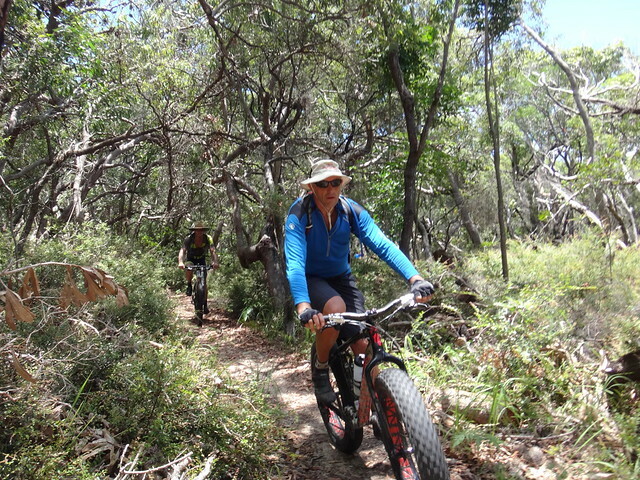 We hopped around a few rocks, and made our way to a secluded fire trail which led up to the top of the headland. 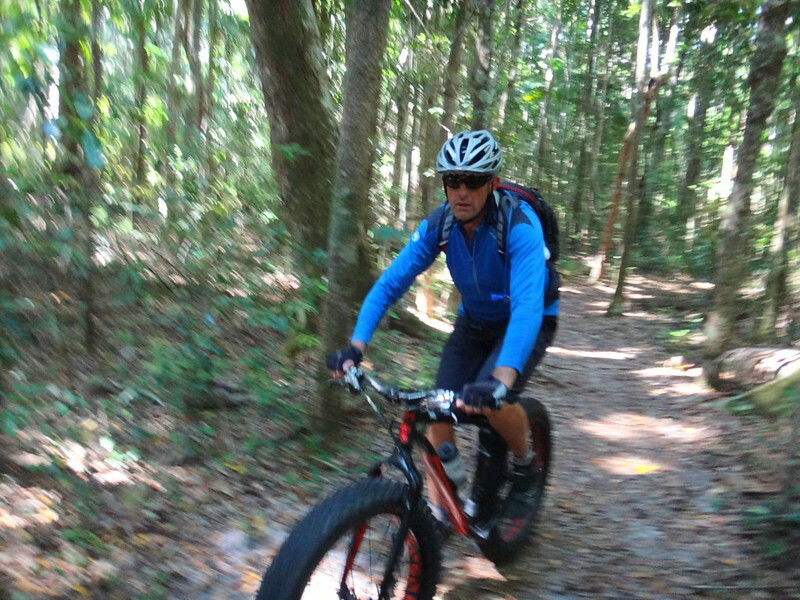 There are a couple of ways to the top, but this one had the gentlest gradient and was rideable for most of the way. The view from the top was breath-taking. The day was unusually hot, and we were running behind schedule. Nevertheless, we rested for a while in the shade of the lighthouse and enjoyed the views. The roll down the hill to the Teewah side of the point was a lot of fun, although we received a few incredulous looks from 4WD’ers at the bottom. 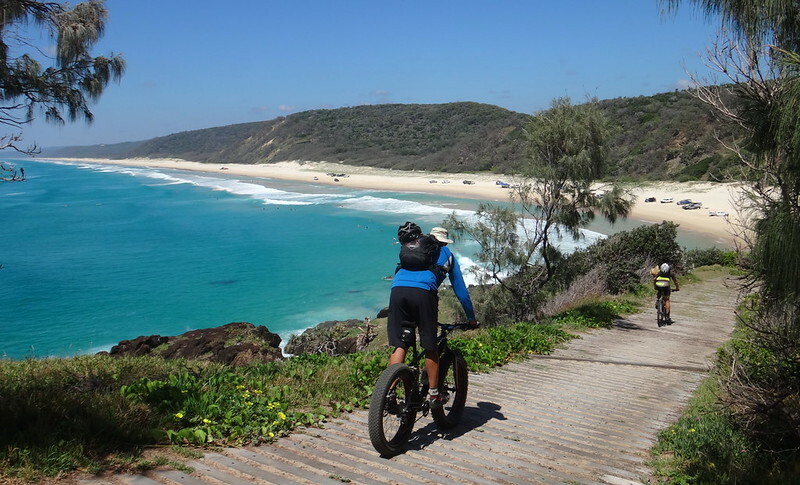 As we rode southwards from Double Island Point along the beach, I hoped to pick up the pace. 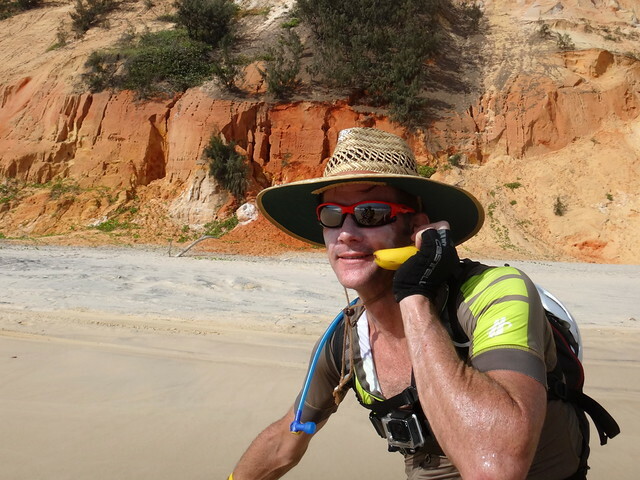 The aim was to cover 30km in about 90 minutes before the tide bottomed out. We gave it our best shot as airconditioned 4WD’s rolled efortlessly past us. 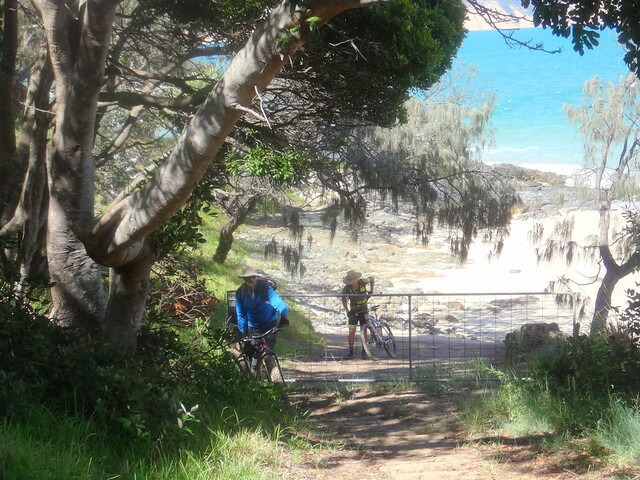 Kids in the back seat held up their smart phones to take photos of of the crazy mountain bikers grinding down the beach in the scorching sun. I started to feel a bit dizzy, and then accepted the fact that today wasn’t the day for epic rides. 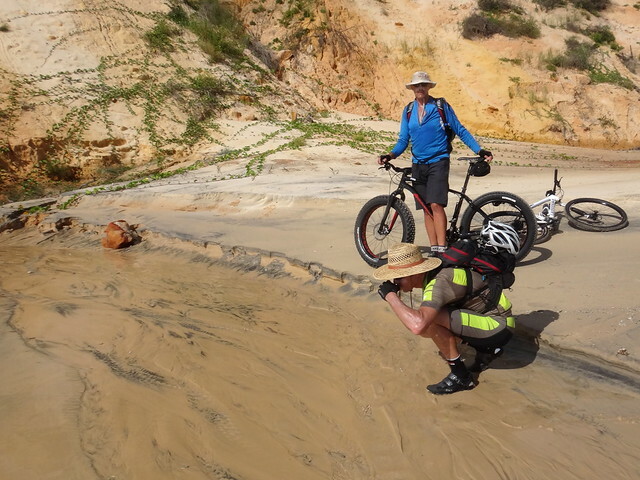 We turned around and rode towards our bail-out option: The Freshwater Track. 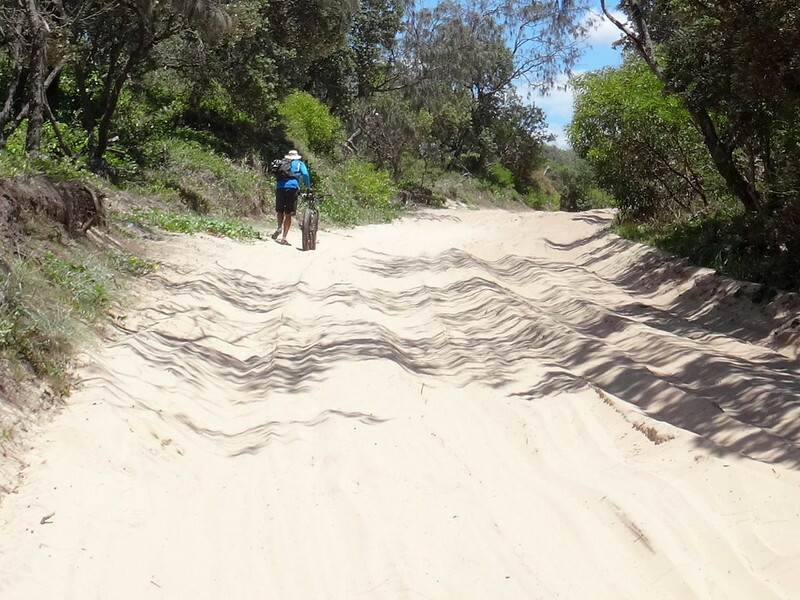 This track starts off with very deep sand. It’s hard enough for motorized vehicles to make their way through it. We just pushed the bikes for a few hundred metres until we reached the day-use area. Then we soaked off under one of the water taps next to a picnic table. The water was untreated, but it cooled us down perfectly. We found a shady walking track near the picnic area. The surface was firm and rideable. 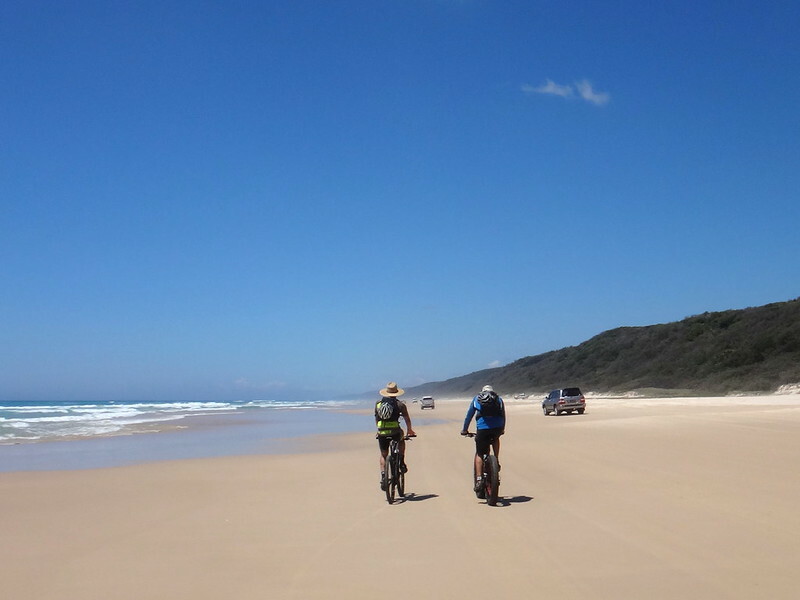 This mean that we didn’t have to contend with 4WD’s on the main track, we didn’t have to trudge through sand, and we could avoid the searing heat of the beach. So we followed it. 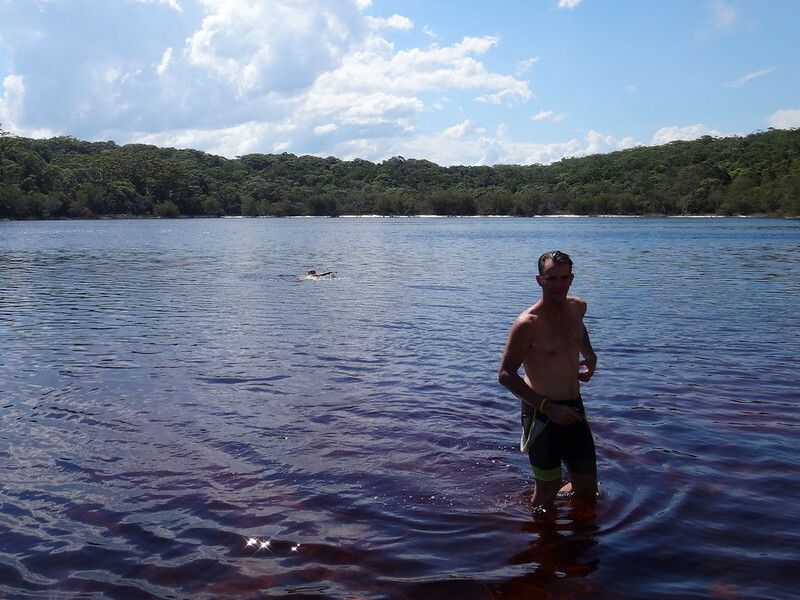 Oh the delicious pleasure of jumping into a cold freshwater lake after battling sand and hot sun! After cooling off, we had a bite to eat then followed the track west. Ancient trees towered above us. 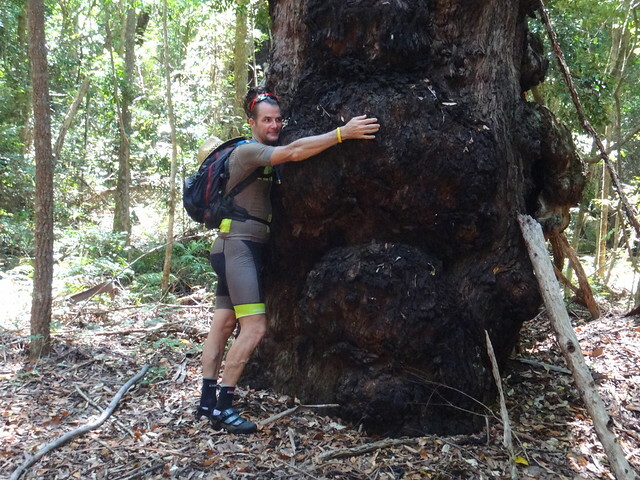 Jason hugged one old matriarch in gratitude for the shade. 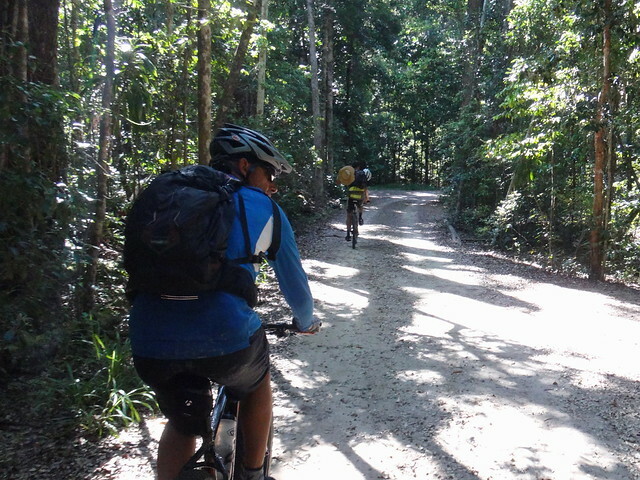 As we rolled through the rainforest, a couple of hikers approached from the opposite direction. “G’day!” I gushed. “Where have you come from?”. “Germany”, one of the hikers replied. 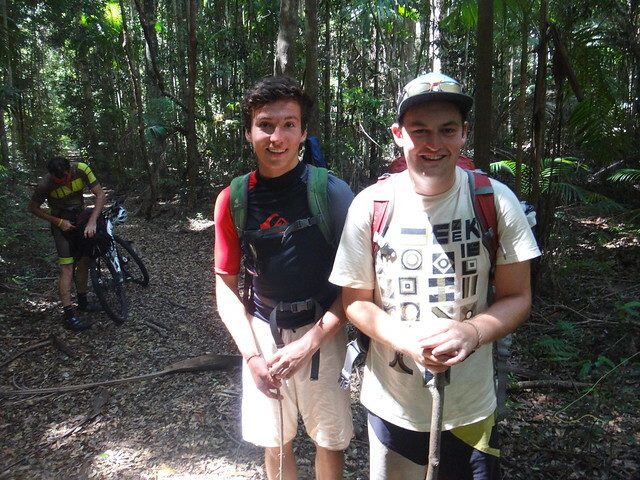 Martel and Alex were here on holidays and had hiked from Rainbow Beach. The ride was hard work. Despite the shade, I was starting to feel a bit worn out again. So when we reached Poona Lake, we decided to be unusually indulgent and had a second swim for the day. The water is stained dark from tannins in the leaf litter. This causes it to absorb more heat. So the top layer of water in the lake is very warm – it feels like a bath. But if you swim deeper than a metre, the temperature drops abruptly. I dove under the hot layer of water into the coolness. It was like entering an air-conditioned room. 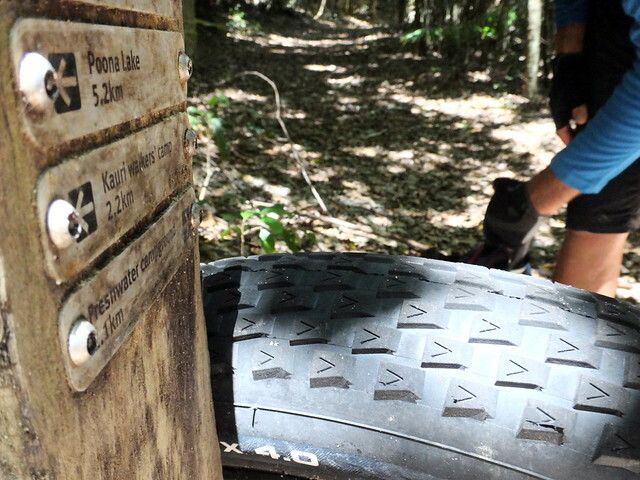 After our second swim, we followed the walking trail back to the main 4WD track. After a fast downhill roll we joined the main road for a quick 5km ride back into town. 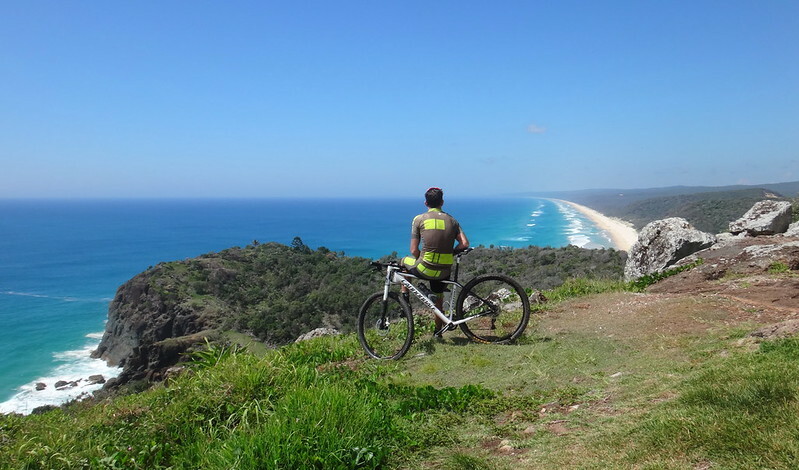 Rainbow Beach is an iconic ride. 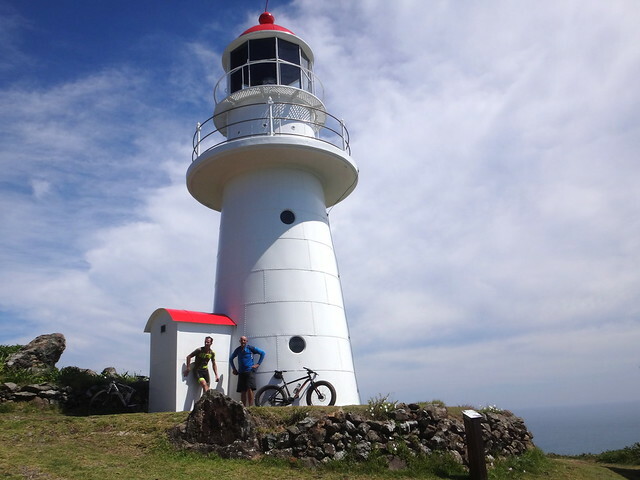 You could easily do the ride out to the lighthouse and back in 3 to 4 hours on a normal mountain bike, provided you started 2 or 3 hours before low tide. With our original plans, I think we bit off a little more than we could chew. Thankfully Jason and Paul were both considerate and flexible, so we were able to adjust our plans and had a memorable day out. I’d rate our ride 9.5 out of 10 on the tough-o-meter. In cooler, kinder weather I think it would rate 8. If you plan to attempt our loop, take plenty of water. Bring some water purifying tablets if you want to drink any of the water from the taps at Freshwater day-use area, or the lakes and creeks. Thanks Jason and Paul for another specatcular day out on the bikes.